Premium Quality Pontoon Furniture You Can Afford. (Pedestal Not Included) Pontoon Boat Seat Dimensions. 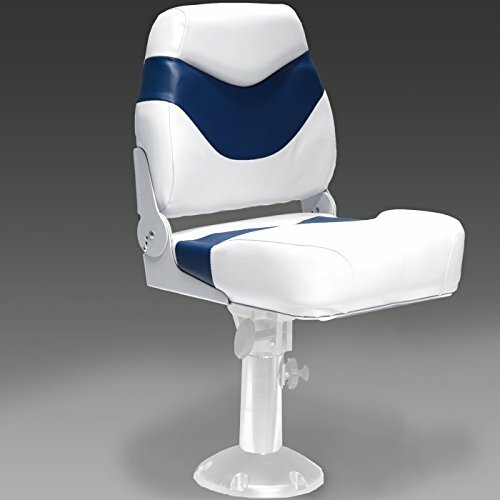 19" overall height from pedestal to top of back rest cushion. 16" overall depth of fishing seat from back rest to front of seat cushion. 17" width of fishing seat cushion. We cut out the middle man! Because we design, build and sell our pontoon boat seats directly, we can offer you the best prices on the highest quality pontoon furniture. Free same day shipping - Order by 4pm EST. Plush boat seat with heavy duty hinges and 30oz marine vinyl. 100% plastic frame with stainless steel hardware. If you have any questions about this product by DeckMate, contact us by completing and submitting the form below. If you are looking for a specif part number, please include it with your message.